Hair: Auburn and curly. Length unknown as she permanently wears a hood. 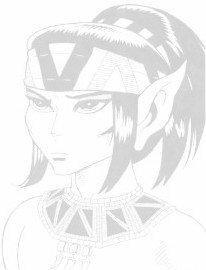 Life history: Toorah is the mother of Leetah and Shenshen and was, until Leetah was born, the closest thing the Sun Village had to a healer. She didn't have any magical abilities, but treated wounds with poultices and stitching. Toorah is a kind woman with an optimistic nature. She has always let her children decide for themselves and hasn't tried to push them into a certain direction. She does care for them very much and wasn't happy to see Leetah leave the village, as I imagine she wasn't when Shenshen left as well. Sun-Toucher probably took the words out of Toorah's mouth when, after the Palace's return and its subsequent visit to Sorrow's End, he remarked "Isn't it strange and wonderful to know we finally have daughters again?"